I met Andre, VP of Optima Strings, on the second day of Summer NAMM 2017. Our introduction to gold strings started when out of the corner of my eye I saw gold reflecting brightly from a Fender Jazz bass as we passed the Optima booth. At first I thought, “that’s silly, someone has put bonze acoustic strings on an electric bass”, but still the sound was clear and punchy. I had to stop to investigate. They were very nice and allowed me to play a bit on the Fender. These strings have tremendous dynamic range on the jazz bass. I was now curious what they would sound like on my Cunningham RLJ-S7 seven string bass. Unfortunately he didn’t have any seven string packs available at the booth, but he gave me a 5 string set instead. That didn’t deter me one bit. I quickly swapped out my 5 low strings with the gold Optima strings and ‘went to town’. An amazing Jazz guitarist, Bruce Buckingham, was nice enough to jam with me at the Optima booth. Find out what happened next in the video below. Enjoy! 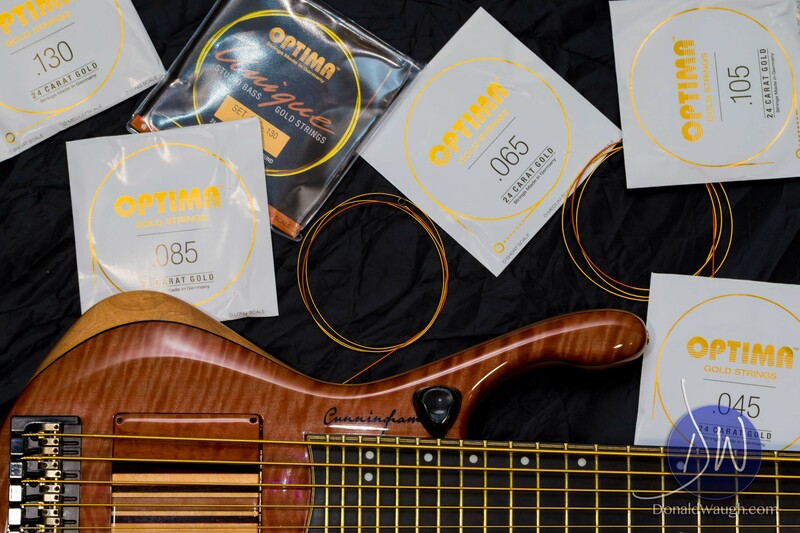 Learn even more about Optima Strings here.